Congratulations Vicki on a fabulous layout. 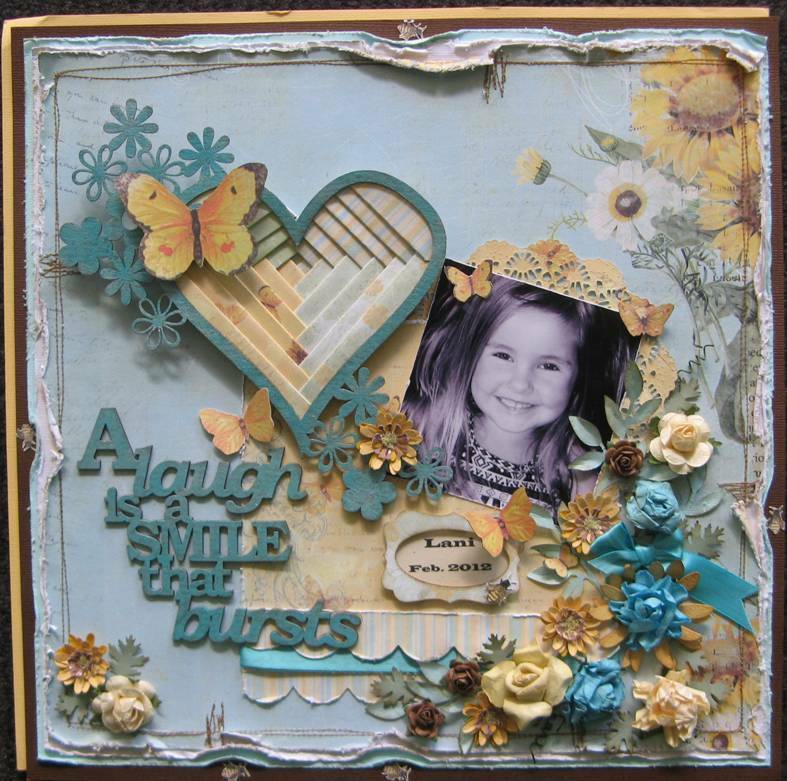 This months challenge kit comprised of the little 2 Crafty Wordlet & Heart/Flowers as well as a packet of aqua flowers & aqua ribbon, the rest was up to you. 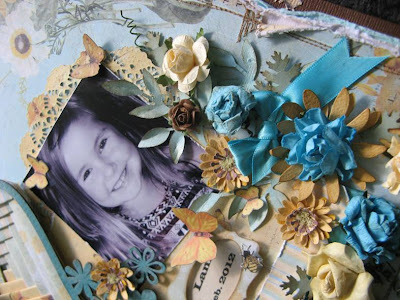 You could add whatever papers, embellishments etc you wanted to & this is what Vicki came up with. 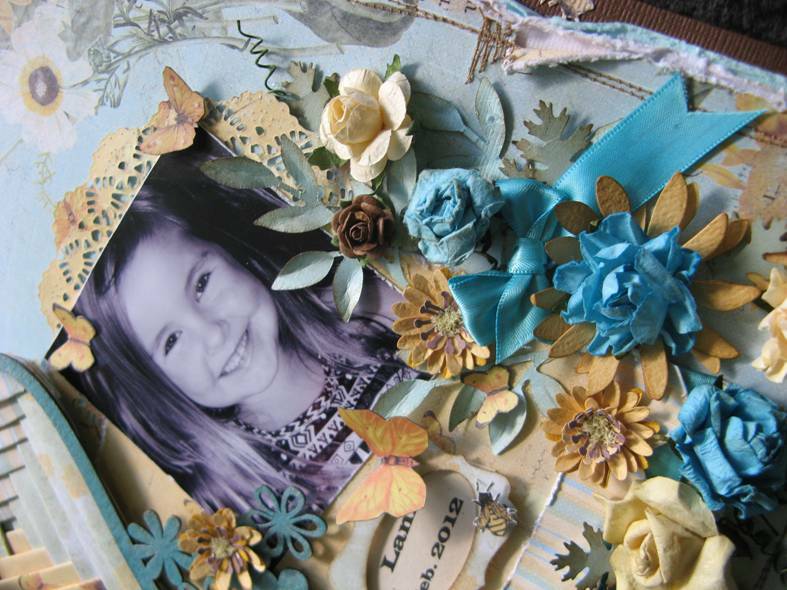 I thought I would show you a few close ups of all the extra little flowers & leaves Vick has hand made & added to her layout. 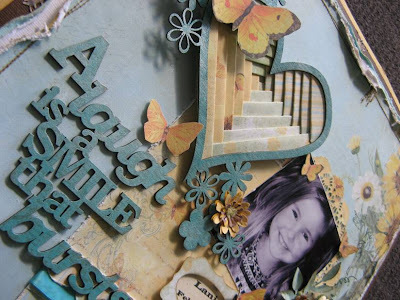 Notice how she has cut out all those little butterflies from the papers she used & she has also die cut a beautiful doilley to place behind her photo. A wanted to give you a close up view of what Vicki has done to her 2 Crafty chipboard heart. This looks soooo beautiful Vicki. It is a shame you cannot see in this photo but she has also done some lovely paint effects on her 2 Crafty wordlet as well. A fantastic job Vicki. For her trouble Vicki wins a $25 Gift Voucher. PS. Stay tuned for next months kit, I will let you know when it is available. If you don't live local & want to enter just let us know & we can mail it out to you. We do this for a few of our country customers. Oh Di I saw this on FB and it is amazing.. the colors are fabulous and all the wonderful details make this a really outstanding layout!! This is a beautiful layout by Vicki, I love the heart and all the flowers. Congratulations Vicki, beautiful work ..so much detail...you definitely deserved to win. Hello again Di, I've left you an award on my blog. Congratulations, Vicki...love the iris folding in the heart.